I first heard about Naked back in March I think and just loved that there whole range was 97% natural and free from SLS and parabens and also NOT expensive like so many other organic brands. Since then I have religious used a whole range of there products and seen them grow as a company - first getting there products into Boots and last month moving into Sainsbury's. Not to mention there exciting new facial skincare range! Not only are there products chemical free but they are luxurious and smell beautiful! An amazing company doing amazing things - I really have my fingers crossed that there Naked products will be in Tesco by the end of 2011! I'm actually not sure if the Sue Moxley range was new to 2010...but lets just say it was! From reviews are the beginning of the year the products seem to of been a let down...however there new Famous by Sue Moxley range is a huge improvement. New packaging, new products, cheaper pricing! There are some really amazing products in the range that are definitely worth a look - especially the lip and eye palettes and my new favourite baked highlighter in Miami (£6). I really hope the range goes from strength to strength in the new year! This is not just another thick, greasy hand cream, it's actually a hand exfoliator! You basically apply this grainy scrub to dry hands and rub in as if your washing them, then just rinse off with warm water to reveal beautifully soft hands. This really is like no other product I have seen on the highstreet and works better than any other hand cream I've used in 2010. I'm sure this is a firm favourite for many people that love a bargain and also a product that does what it says! Which is definitely this. This will remove all eye makeup within 40 seconds without any scrubbing or redness. I also secretly use this as an oil cleanser when I'm being lazy to remove all of my makeup! Does what it says and does it well! There isn't much to say about this, except it works. This give relief to dry, cracked, chapped lips. Great to smooth on in the comfort of your own home as an intensive treatment or to rub in when your out in the cold. Yes, I realize this is actually a nappy cream and isn't meant for the lips but this truly works wonders for ugly cracked lips as a overnight lip treatment. This is the only thing I use when I need to restore my lips back to there normal state. It has got a slightly creamy shade to it so it can't be used in public but it is tasteless and 100% safe on the lips. This is the cheapest yet most sensitive teeth whitening product I've found on the market - plus if doesn't involve any trays or nasty tasting gels. Just a mint flavoured powder that you dip your tooth brush in and use as you would any tooth paste. I use this up to 3 times a week and really have noticed a big even difference to mention the product! I recently reviewed this (here)as it's just the best foundation sponge I've ever tried. This creates a totally flawless effect within seconds. Also blends in concealer and cream blush. High quality and a must if you are looking to create that natural dewy look to the skin. There's just something about this brand that I trust and believe in - every Avene product I have so far tried has worked. I love there simple concept and there lack of any nasty chemicals (so perfect for sensitive skin). I use there Clearing gel and Thermal water almost daily. From there gorgeously luxe feeling Coco de mer Body Butter to there cookie dough scented Jojoba exfoliating Face Wash to there amazing multi purpose Starflower Hand & Body Lotion, I love it all! Just an amazing range of products. I'm sure some of you may umm and arr about this choice - however I'm talking about the brand as a whole. There constant 'spend so much and receive a free gift worth over £23' campaign, not to mention there much loved £5 free vouchers that happened quite regularly in 2010! Aside from there offers they brought us amazing multi award winning skincare in there Protect & Perfect line and revolutionary products such as the Exceptional Definition Mascara that had three different sides too it. There sales staff are helpful and not pushy and there products are always of good quality. Not to mention the amazingly talented Lisa Eldridge is the brands Creative Director. Asos has really been a great website in 2010 - with there Free Delivery and amazing sales. But what I love the most about the site is there Beauty section, always stocking the must have products and up coming brands like Yes To Tomatoes and Nail Rock. 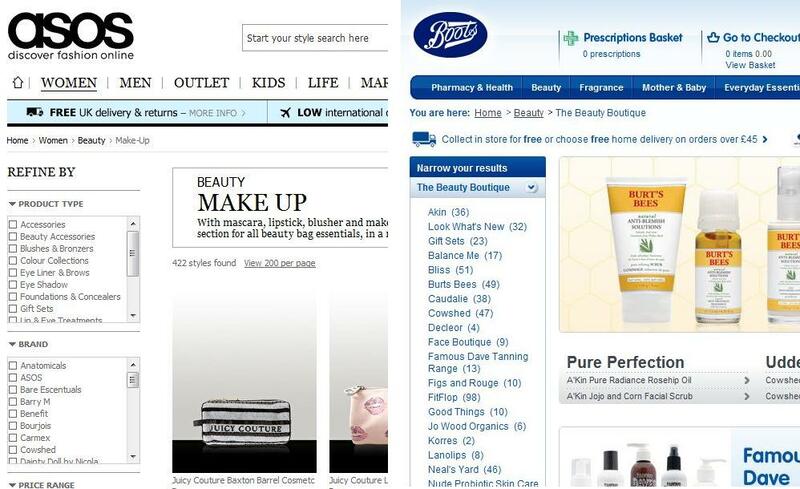 Boots has also been a much used and loved site this last year with there handy free delivery to store. There beauty products also just seem to grow and grow with new brands such as Burt's Bees, Neal's Yard and Good Things. Easy navigation and good pricing make this a website I will always rely on. Make sure to check out the Makeup Savvy Awards here if you already haven't and I will see you all in the New Year. Hope you all have a fab New Years eve! Brilliant post, Have not tried the Naked Bodycare range yet but now it has won your catergory i will have to give it a try for myself!! I love these Savvy Awards! you should do them every year!! I quite like the "Famous" make up range, think i might get some more now! Just ordered Eucryl Freshmint Tooth Powder from ebay to try :) Simply because I will forget the name of it next time I'm exploring British stores haha. Hope it works for me too! Thank you for recommending it. 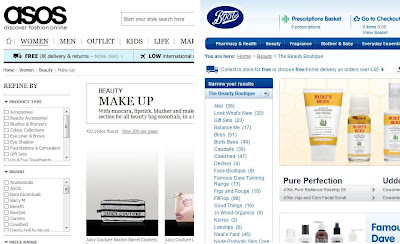 I'm really considering the Boots Botanics eye makeup remover! Also, where can one get the toothpoweder from? i've heard so much about the naked line, i'm really intrigued! great post, fee :). hope you have a fab time celebrating new year's! As for the Eucryl tooth powder you can buy it from most chemists I've found or Ebay ofcourse! Fab post! The Euceryl looks good, might have to get me some. I had my first Naked set quite a number of years ago now and loved it, they've come a long way since then! The cosmo beauty blender-esqu sponge is going on my wishlist! I found the tooth powder in Poundland *pretends I don't shop there often* (toilet roll)...I also add bicarbonate of soda to give it an extra whitening boost! Love the no7 exfoliator, it is one of my favorite products for my 'winter skin' I got it in a set for xmas a year ago and loved it since. And the Eycryl powder is fantastic, I was randomly introduced to it by my OH! These are all good products for beauty care. This blog is providing great information about pretty look. Women can visit here and get beauty tips. Amazing article. Your blog helped me to improve myself in many ways thanks for sharing this kind of wonderful informative blogs in live. I have bookmarked more article from this website. Such a nice blog you are providing ! Thank you so much for share. What a great post. Very helpful post for us. Here Is Daily updated HSC Routine 2019 for Bangladeshi People Who are looking for to establish their career. I hope you guys will be like this Job Circular Website. Thanks again. I enjoied your article very much. Thanks for sharing such kind of informative and helpful article. Thanks for sharing such a great information with us. Your Post is very unique and all information is reliable for new readers. Keep it up in future, thanks for sharing such a useful post. I am really helpful from here.